Ayrton Senna was probably one of the most gifted Formula One drivers ever. This is a great documentary on the short time he spent in Formula one before his tragic crash in Imola in 1994. This documentary has full co-operation from his family and so there is lots of family footage throughout. We all know the story of Senna’s crash but there was so much more surrounded that weekend with up to 3 other crashes that weekend. Great documentary. Worth a watch. Senna is the true story of Brazilian motor-racing legend, Ayrton Senna, whom many believe was the greatest driver who ever lived. 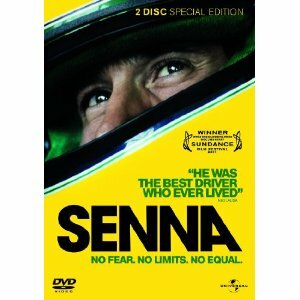 Spanning Senna’s titanic Formula One career, the film charts his physical and spiritual journey, both on track and off; his quest for perfection and his ultimate transformation from a supremely gifted novice, who exploded into F1 in 1984, to myth after the tragic events of Imola in 1994. Made with the full co-operation of the Senna family and Formula One Management, Senna is the first official documentary feature about his life, featuring astounding archive material, much of which is previously unseen. This entry was posted in Movie Of The Week and tagged Music. Bookmark the permalink.